With temperatures dropping and winter just around the corner, it’s time again for comfort foods. There’s nothing like a hearty soup or stew on a cold day! 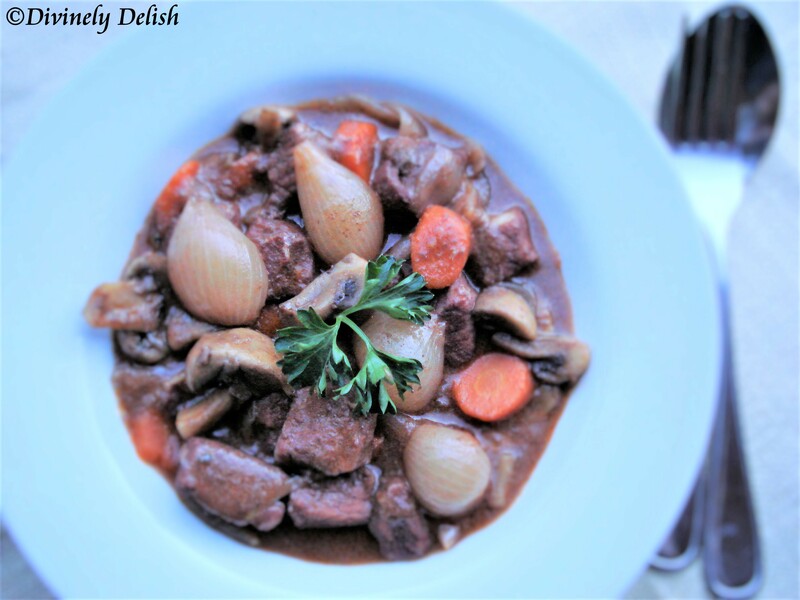 One of my favourites has got to be Beef Bourguignon, a classic dish which originated in the Burgundy region of France. What sets this apart from ordinary stews is that the meat is first braised in red wine, and this wine marinade is later incorporated into the stew during the cooking process. As you can imagine, what you get is a a truly flavourful dish with subtle hints of warm spices. I’ve made this dish countless times, and it never fails to impress. It is a bit time-consuming, as it requires more steps than just chopping up all the ingredients and throwing them into a slow cooker. But I guarantee you that you will have no regrets once you taste the end result. Eat it with thick, crusty bread to sop up the sauce – that’s really the best part! 1) Combine all the ingredients, including the meat, in a large bowl. 2) Cover with plastic wrap and refrigerate for 12 hours, tossing the meat occasionally. 3) Strain the beef and the vegetables from the marinade, reserving the liquid. 4) Separate the meat from the vegetables. 5) Pat dry beef and discard vegetables. 1) In a large Dutch oven, heat 1 tbsp (15 ml) of olive oil over medium heat. 2) Add bacon and cook until transparent (not brown), about 5 minutes. 3) Remove bacon with a slotted spoon and set aside. 4) Season beef lightly with salt and pepper and working in small batches, add meat to the pot and brown well on all sides. 5) Remove meat and set aside. 6) Heat oven to 275 F (135 C). 7) Add pearl onions and carrots to the pot and cook, stirring occasionally, until they start to brown (about 5 minutes), adding more oil if necessary. 8) Lower the heat to medium-low. Sprinkle the flour into pot and continue to cook for another 5 minutes. 9) Add bacon and beef and mix well to incorporate flour and vegetables. 10) Add reserved red wine from the marinade, beef stock and tomato paste. 11) Season with salt and pepper. 12) Bring to a boil, cover and place into oven. 13) Cook until the meat is fork tender (about 2 hours). 14) Remove the cover and cook for an additional 15 minutes. 1) For garnish, heat olive oil over high heat in a large skillet. 2) When hot, add mushrooms and sauté until brown and juices have evaporated (about 8 minutes). 3) Add garlic and season with salt and pepper. 4) Add mushrooms to beef and stir to combine.